Deep Woods and I each used a Katadyn BeFree this time around, filtering nearly 40 liters apiece over the course of the trip. Not enough to give a fair evaluation, especially considering that nearly all sources filtered from were clear and gunk-free. No issues whatsoever though. Flow rate was great. Certainly better than that of the Sawyer Squeeze filters we saw being used. I never felt the need to pre-filter (using a bandana, coffee filter, etc), choosing to only do the “swish in water” or the “shake and dump” thing every couple of fills. 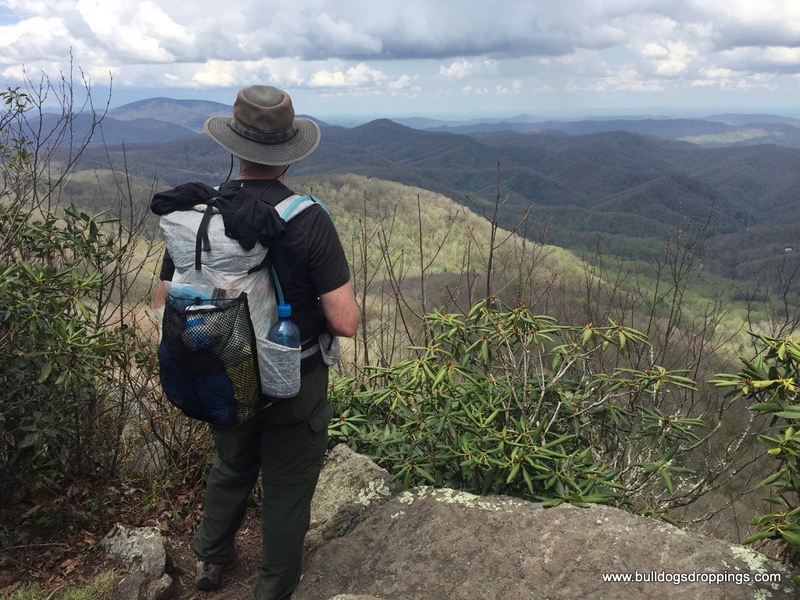 We ran across several thru hikers using the BeFree and each one was very happy with their choice. They said they hadn’t experienced any noticeable reduction in flow rate nor had any issues with the stock Hydrapak bottles, though one person had switched his out for a 3L for bulk filtering. Only time will tell if it continues to perform well and hold up. They still have a lot of water to filter before reaching Katahdin. Water sources were frequent so the majority of the time I carried no more than one liter. We filtered on the fly and the high flow rate meant we weren’t stopped for long at all. Using Katadyn’s BeFree to filter water for the night from a nice piped spring. My one beef thus far with the BeFree is being locked into using the Hydrapak bottles. Should the bottle catastrophically fail in the middle of a hike, you’ll likely have a hard time getting your hands on a replacement right away. I carry some Micropur tablets regardless, just in case. 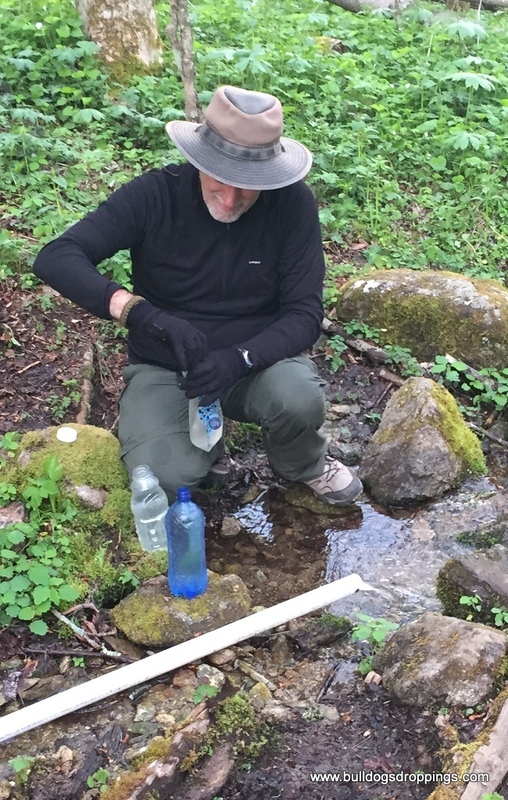 Personally, I believe the ability to screw the Sawyer Squeeze or LifeStraw’s new “Flex” filter onto a standard water bottle or Platypus bottle, combined with their long life span, make them more appropriate for a thru hike. LifeStraw’s “Flex” filter is also coupled with a carbon filter which can be removed. Attach and use the carbon filter if you’re concerned about odors and to improve the taste of your water. Considering the generally good quality of water on the AT, most people would probably elect to leave off the carbon filter, which has a rated lifespan of just 25 gallons. With that removed, it’s a bit lighter than the BeFree and has double the rated life span (500 gal as apposed to the BeFree’s 250 gal). I’ll continue to use the BeFree, at least on the AT, until she gives out, which for me will probably be quite some time. However, I’ll then either switch to the LifeStraw “Flex” or see what else has come to market that can be used with standard bottles. Since the Dyneema composite (formerly know as Cuben Fiber, hence the CF) version of the Deschutes is no longer available, I’m not sure why I’m bothering with this other than to say I love it. I’ve always stayed high and dry under it, without any condensation to speak of, though I’ve never had it out in a really hard, driving rain. 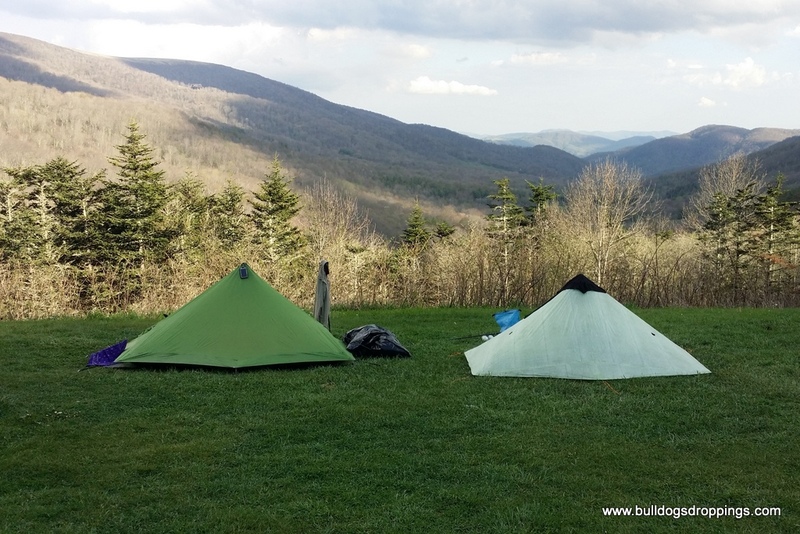 Deep Woods’ SMD Lunar Solo (L) and Bulldog’s SMD Deschutes CF (R) pitched at Overmountain Shelter on the AT. The Deschutes should have been pitched higher here. My one concern with the tarp is the #3 zipper used for the door. With all of the stress it’s under once the tarp is pitched and tensioned, I can see the tiny zipper failing at some point in the near future. If and when that happens, I think I’ll modify the tarp, doing away with the zipper altogether and adding overlapping wings to the doors, using clips to hold them down, similar to the way ZPacks does on their Hexamids. It’s worth mentioning that Six Moon Designs is supposed to be coming out with their new line of shelters soon, incorporating lighter, stronger materials. I’m anxious to see what they come up with, as I’ve always liked their shelters. I made this frameless pack, just the second I had ever made myself and the first and only out of Dyneema composite, back in 2013. It’s closing in on around 600 miles of use. Not much as far as packs go and as you might expect from the 1.43 oz/yd2 variant , it is already starting to show signs of wear. Nothing major. Two pea-size holes in the hip belt which were fixed with patches from ZPacks and some fraying on the hip belt and shoulder straps. Surprisingly enough, I’m not seeing much thread hole elongation at the point where the top of the shoulder straps attach to the pack, even though I commonly overloaded the pack in the past (20 lbs or more is what I’m considering overloaded). Still no holes in the bottom of the pack body, not even in the corners. I’m expecting holes to continue showing up in the hip belt, as this appears to be the highest wear-point. I’m really surprised by the lack of thread hole elongation though. The straps are attached directly to the pack body using bar tacks in a “boxed X” pattern, for lack of a better term. So far, so good. The homemade 1.43 oz/yd2 Dyneema Pack, stuffed to the gills here, is still going strong. It has some flaws. For one, I should have made the torso length a bit longer. Works but not ideal. The rear mesh pocket is way too big and sags, even when I cinch things down with the shock cord. The pack body needs to a be bit larger so some of my gear can shift back from the rear pocket to it. Regardless, I’m having a hard time relegating this pack to just weekend solo trips. I can’t seem to let go of it. It’s like an old friend and I imagine I’ll continue to use it until stuff starts falling through the bottom and/or the weight of all of the patches offsets that saved by using the Dyneema in the first place! Finished weight with the hip belt pockets is 10.5 oz. I’m still on the fence as to whether I would use the 1.43 oz/yd2 Dyneema composite again should I make (or have someone else make) another pack. More than likely I’ll go with one of the variants of X-Pac, sacrificing a bit of weight savings for much greater durability. Seeing as how my current pack is made from just a tad more than 1 yard of fabric, going with the X-Pac would mean an increase of about 3 or 4 ounces finished weight, all other things being equal. I can surely make up the difference elsewhere while getting a more robust pack and still keep total packed weight with 1L of water and 4-5 days of food at or below 18 lbs. Not too shabby. I made this quilt back in 2013 after finishing the Dyneema pack. The Pertex was sourced from ZPacks and the Momentum, baffle mesh and down from Thru Hiker as part of their kit. The Momentum 90 that also came with the kit is still sitting in the closet. I’ll eventually put it to use, possibly for a wind shell or down jacket. There are draw cords on either end and a 12″ strip of velcro at the bottom to close it up, making a foot box for colder conditions. Laid out flat, it measures 74″ long, 50″ wide at the head and 36″ at the foot. I used approximately 9.2 oz of fill, yielding almost 2 inches of loft. I’m certainly not qualified to say that should equate to this or that degree rating. Looking at the specs of various quilts available on the market would suggest a rating of around 30° but there are so many variables to consider (pad used, base layers worn, etc) that I have no clue. All of the science stuff is beyond me. I just took a stab at it and that’s what I came up with. 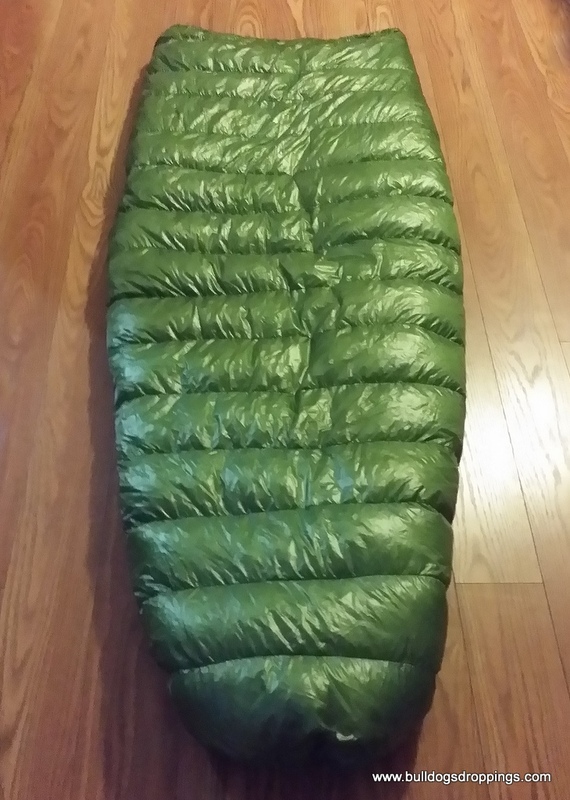 Those specs make it just bit smaller than an Enlightened Equipment 950fp Revelation 30° Regular/Slim quilt (78″ x 50″ x 38″ with 2″ loft). Mine came in at a finished weight 15.4 oz. The Revelation is supposed to be approximately 15.02 oz so I guess I’m in the ballpark. In hindsight, I wish I had made it both wider and longer. I’m 6 foot on the button and move around a lot through the night. I’ll often wake up to a draft on one side or the other and it’s a squeeze when I stretch out on my back, feet pointing up. Using pad straps, something I left out, would almost certainly help with the draftiness, though it still needs to be a bit wider to allow for my flopping around. Were I to make another, the baffles would also be ran length-wise, at least down to the foot box, to prevent the down from settling towards each side. Thus far, I haven’t experienced temps below freezing while on the trail and using this quilt. I’ve been sufficiently comfortable using my un-insulated pad and wearing a mid-weight base layer down to the low 40’s. Below that, I start getting cold. The un-insulated pad and lack of pad straps aren’t helping. I’ll continue to use it on the April/May AT hikes and hope we keep getting fantastic weather. The second half of this year’s trip was so warm that I often skipped the base layers and slept with my legs sticking out. That new Big Agnes Insulated AXL pad (mummy version) that I mentioned in an earlier post is supposed to weigh in at 10.9 oz. That’s less than my un-insulated Exped and you can bet that it’ll be on my list to Santa. In the meantime, Loonie will be recruited to make some removable pad straps. The total package should help keep me nice and toasty. The temperature got down below my quilt’s “comfort” level a couple of nights early in the trip and I ended up wearing everything but the gloves, extra boxer briefs and Dri-Ducks. Late in the trip, I was fine in just a pair of boxers and socks. The extra pair of boxers, socks and Dri-Ducks pants came in handy when doing laundry but otherwise weren’t needed. I only wore the Dri-Ducks jacket once – as a wind breaker. Unless much colder temps are predicted, I’ll likely carry pretty much the same next time. Since Deep Woods used his JetBoil and David used a Pocket Rocket 2, I brought my JetBoil. That way we would all be eating about the same time, rather than me sitting around watching them eat while waiting for my water to boil over the Esbit or alcohol stove. Was this really necessary, especially considering the extra weight carried? Nope and I doubt I’ll do it again. I’ll likely go back to the Heini pot/Esbit setup while looking further into stove-less meal options. I really enjoyed my nightly cup of Juniper Ridge Douglas Fir Spring Tip tea though. Terra “Crazy Legs” James, whom Loonie and I met on the AT in the Smokies back in 2015, turned us onto this stuff and it’s the bomb! Expensive but so worth it. I’ll carry a stove from now on if for no other reason than to have a cup of this stuff at the end of the day. It’s that good. For what it’s worth, I did try out the Cambell’s soup cup and lid idea that I ran across on BackPackingLight to replace the broken stock skirt and lid and they worked out great! As far as the rest of my gear, the only notable changes from my old gear list were a ZPacks Bear Bag Kit (my old homemade one was too small) and a Pistel Wide Brimmed Hat instead of the ball cap.